A tactical skirmish miniature game where players choose a company of models to battle enemy factions on the most brutal battleground imaginable, the realms of Hell! I’ve had my eye on Hell Dorado for quite some time, and those stunning miniatures have often beckoned. I also love the background concept: 16th century empires squabbling with demon hordes, and each other, for territory in the subterranean regions of Hell. I managed to put aside temptation for quite some time, and it did seem the game was fading away after it was dropped by Asmodee, but Cipher Studios picked up the licence (sadly, it now seems to be fading away again) and when I saw the rulebook was on special recently I grabbed a copy. Since then I’ve painted three companies—Demons, Westerners and Immortals. The miniatures are imaginative, still made of metal, often frustrating to assemble—some modelling experience is required—and the results somewhat fragile for tabletop gaming, but they are beautiful when painted up. Like any tabletop miniatures game there are a ton of special abilities in the rulebook, so this rules summary and set of reference sheets should make life easier for players of the game. Unfortunately the unit cards that come with the figures are some of the most atrociously designed, unreadable messes I’ve ever seen, so I had to redesign them for the models I have—though I must forstall requests and say that I have no current plans to take on the huge task of redesigning them all and making them available for download. I really enjoy games of Hell Dorado and it’s different enough to have a special place in the list of tabletop miniatures games I play. And there really is nothing like those gorgeous, often weird miniatures. Soda Pop miniatures/ninja division had taken over Cipher Studios and now this ! AnimaTactics dropped and Hell Dorado limping along with restricted distribution which sounds rather ominous. “Anima Tactics™ and Hell Dorado™ will no longer be sold through distribution. The ranges for both product lines will remain available online through the Ninja Division | Soda Pop Miniatures web store. It really is ridiculous and pretty annoying really. I’m not sure why licences are bought by companies who obviously don’t have the resources to promote and develop them; perhaps because they think they can get a decent income out of the dying fanbase, but it’s a short term strategy at best. 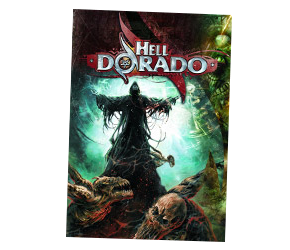 Stopping distribution of Hell Dorado is just the latest step on what seems to have been a long, slow decline, exacerbated by a poorly run Kickstarter campaign. I will be curious to see what the next wave holds, but I think I saw the writing on the wall way back when this terrible, static figure was released (which no one could even bother getting painted). Plenty of people out there want to support Hell Dorado, but they’ve all pretty much given up due to the crap way the game has been supported and the lack of communication from the companies involved. Which is sad and, let’s face it, a foolish way of doing business. I often seem to get into miniatures games that are defunct (eg Confrontation and AT-43) which I actually don’t mind too much, as I enjoy collecting a finite number of miniatures. Thankfully, there’s plenty of stuff out there with which to enjoy games of Hell Dorado for many years to come. It is hard to see the point of obtaining a game then strangling it. Cipher Studios took over from Asomdee with hints of big things but the only things they did was to down-size the starter boxes and release a few figures for the factions a few years ago. It is hard to imagine SodaPop/Ninja Division doing much promoting of HD considering it seems so different from their other games, their track record with Relic Knights and now their focus on Ninja All-Stars. I hope I’m proved wrong. The theme and imagery of HD possibly made it a bit of a problem to market. I recall seeing censored versions of the illustrations & boxes on some US websites. Also hope any new releases are way better than the Michael Legatus figure you linked too. It has none of the spirit nor craftsmanship of the earlier HellDorado releases.